Salman Rushdie will deliver a public lecture, "The Liberty Instinct," on Sunday, Feb. 15 at 5 p.m. in Glenn Memorial Auditorium. Emory Photo/Video. Acclaimed author Salman Rushdie returns to Emory University during February as University Distinguished Professor for a public lecture on human rights and a number of events and classes. Tickets are now available for Rushdie's public lecture, "The Liberty Instinct," presented by the Emory College of Arts and Sciences and the Office of the Provost on Sunday, Feb. 15, at 5 p.m. in Glenn Memorial Auditorium. Tickets are free, and can be ordered online. For more information, visit www.emory.edu/events/rushdie. “Human beings possess a natural ‘instinct’ for freedom. We prefer liberty to ‘unfreedom’ and that instinct is related to self-consciousness — to knowledge of ourselves as autonomous beings in the world,” Rushdie notes in a description of the lecture. “Out of this ‘liberty instinct’ comes the idea of human rights. These rights involve neither liberal nor Western fictions but rather connect to our deepest needs as human beings,” he adds. 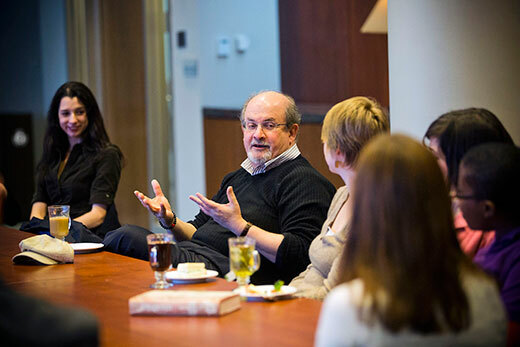 Coalition of the Liberal Arts: The Emory Story Project presents the invitation-only “A Conversation with Salman Rushdie” on Thursday, Feb. 19. The evening will begin with a faculty, student and alumni dinner to discuss Rushdie’s memoir, “Joseph Anton.” Rushdie will describe his experiences as a college student and open a discussion about education. Following the conversation with Rushdie, attendees will break out into story circles, in which all participants will tell their own stories about their college and Emory experiences. Rushdie will also participate in the 15th annual Twelfth Night Revel celebration and poetry reading on Friday, Feb. 20, at the Manuscript, Archives and Rare Book Library. Tickets start at $200, benefiting MARBL. The event features Carol Ann Duffy, Britain’s poet laureate. Rushdie’s second public event during his visit will be a panel discussion on "Disability Rights as Human Rights" on Tuesday, Feb. 24, at 4 p.m. in White Hall, room 207. Hosted by Emory’s Disability Studies Initiative, the panel will be a conversation with Rushdie, visiting philosopher Eva Kittay from Stony Brook University, and Emory English professors Rosemarie Garland-Thomson and Benjamin Reiss. Additionally, Rushdie will visit a variety of classes to discuss topics ranging from caste and contemporary India, to his own works such as "The Moor's Last Sigh," novels that have influenced him, as well as "A Midsummer Night's Dream," "The Wizard of Oz" book and film, and Gandhi.